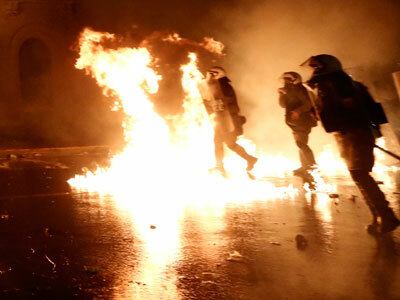 Dozens of Greek activists protesting austerity policies broke into a conference and clashed with police in a protest against a German government official. ­Law enforcement officers used truncheons and teargas to disperse some 250 activists in the northern city of Thessaloniki, where a meeting of Greek and German mayors was taking place. Riot police formed a shield around German Consul Wolfgang Hoelscher-Obermaier, who was attending the event, after some of the protesters stormed into the conference center complex. The intruders were trying to pelt the diplomat with bottles of water and coffee. The protestors changed "Nazis out" and "This will not pass", while holding mock gravestones and banners proclaiming "Fight until the end!" Germany is the biggest contributor to Greece’s bailout loans and is demanding strict budgetary restrictions from Athens in return. 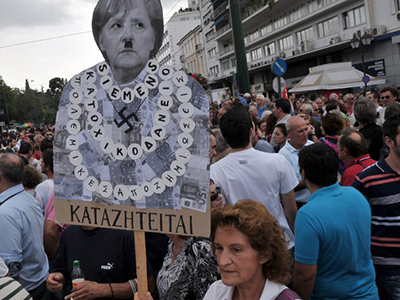 This made German Chancellor Angela Merkel and other officials common targets for Greek anti-austerity protesters. 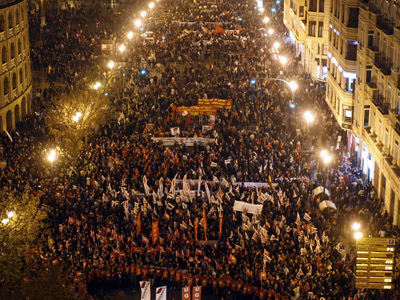 Last month, around 50,000 people demonstrated in the Greek capital, when the chancellor paid a visit to the country. The municipal workers, who took part in the protest, wanted to voice their anger to Fuchtel, who was also present at the Thursday event. 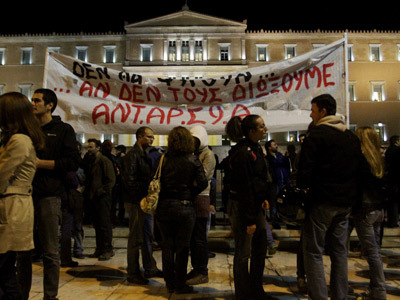 The Greek parliament introduced the latest austerity package last week, as some 100,000 people protested in front of the building. It includes raise of the retirement age and taxes and pension cuts. The passage of the bill triggered a violent riot, which was clamped down with water cannons and teargas.